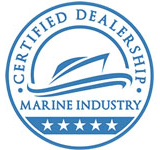 Our dealership believes in the tenets of the Marine Industry Certified Dealership program set forth in this consumer commitment. Established jointly by the Marine Retailers Association of Americas and the National Marine Manufacturers Association, these principles are established to ensure you an enjoyable boating experience. We seek to enhance that experience by providing trained, friendly employees, quality products and reliable services. As part of our desire to continuously make improvements, please let us know if we should fail on our commitment or if you do not understand any information provided to you. the assistance of a capable and knowledgeable sales consultant. advertising and representations that are truthful and factual. a written disclosure of all details associated with a purchase. an explanation of the proper usage and operation of products. products properly prepared, inspected and tested before delivery. the delivery of new products as scheduled. an explanation of all maintenance requirements and schedules established for your product. an explanation and written copies of warranties on all products and major components. the explanation of maintenance/repair plans including estimated repair time and cost. an itemized list of all charges with thorough explanation. prior approval of changes in repair costs or additional charges should they occur. maintenance/repair work done right the first time by knowledgeable trained technicians. maintenance/repair work completed when promised. timely notice of changes in service delivery time if delays are experienced in repair completion. Inspection of any replaced/damaged components upon presentation of the invoice/work order. fair, open and honest treatment without discrimination. respectful, professional and accurate responses to all your product questions and requests. privacy and confidentiality of customer records. This is our commitment to you. You should expect a higher standard of professionalism when working with us. Please hold us accountable to that expectation.